Peggle 2 is the latest entry in the popular Peggle series of casual puzzle games developed by PopCap Games and published by Electronic Arts for Xbox One (timed exclusive) and other platforms yet to be announced. 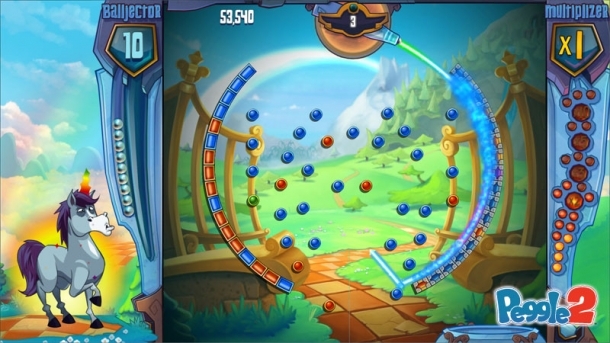 Peggle 2 challenges players to similar peg-busting gameplay of the original Peggle, but adds new levels, features, power-ups, multiplayer modes, Peggle Masters, and motion controls. 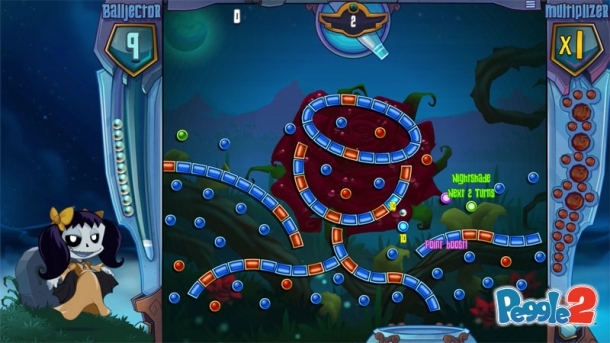 Peggle 2's gameplay is similar to that of the original Peggle, which was inspired by the games Pachinko and Bagatelle. The game is divided into stages and the player is given a limited supply of balls on each stage with the challenge of shooting them at clusters of orange-coloured pegs, the goal being to clear out all of the marked pegs and achieve a high a score as possible.